This post is in honor of International Mud Day… whoever made the last Wednesday of June “mud-day” does not live in Texas. The heat index was 107 yesterday and it’s dry, very dry… while we LOVE mud and LOVE playing outside, this is just not the time of year for outdoor play (well, after 8:30 in the morning. Our neighbors must love us). 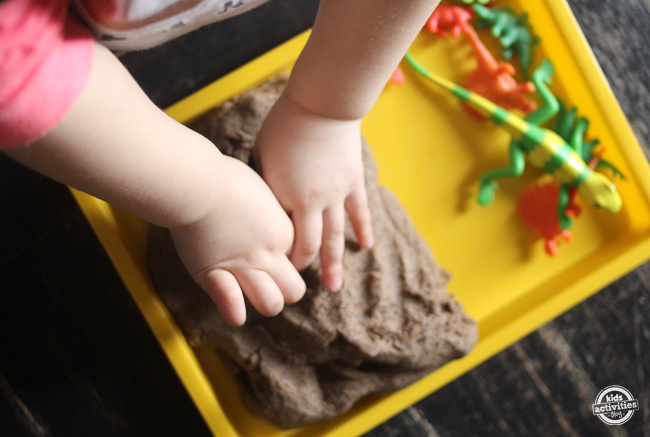 So we decided to bring our love of mud inside in the form of playdough, yummy smelling coffee playdough. I wake up just sniffing this stuff! 2 Teaspoons of Cream of Tartar (she called for more, but this stuff is hard to find, so I cut the amount by a third). Anna also called for glycerin drops. We didn’t have any “drops” but I shaved a tiny piece off of a bar of soap. Glycerin Soap bars are the clear or see-through kind. A little bit goes a long way. Mix the dry ingredients. Add the wet, stir bunches. Let it sit for awhile to thicken, then stir some more. Do you want to win some of my playdough or other stuff we make? Occasionally, I do facebook-only giveaways (like yesterday) and one lucky facebook fan won a portion of this batch of coffee playdough! Follow the Quirky Momma facebook page to learn about some of my favorite sites and all the activities that are on my to-do list… I love connecting with you, my readers, on there! … And, if you like mud, come back tomorrow! We will feature a collection of some muddy ideas discovered from some of my favorite sites. This is just total EXTREME genius!!! I am def trying this! For the smell alone it would be worth it! Thanks for sharing your awesome ideas! Thanks for the great recipe and photos! Will definitely try this out! What a very cool recipe! I can relate! We are also in Texas and we also have forgiving neighbors in the morning (so far). Awesome idea, and I will be checking in again for the mud ideas. Awesome job! I must make this next time my husband makes some coffee!!! Please link up over here if you get a chance! The heat and humidity here too is not encouraging outdoor play. 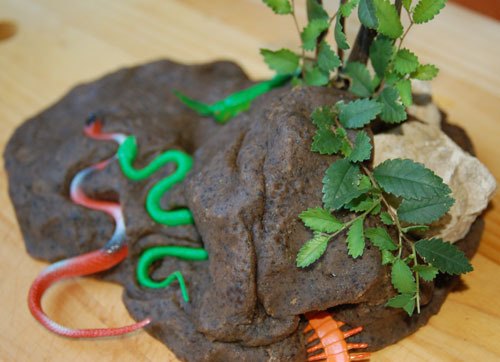 This recipe for mud play dough sounds so cool. We have to, have to try 🙂 Thank you for sharing ! Hey, Rachel! I just finished my post were I tagged you. 🙂 Check it out! My kids would love this. I agree it’s too hot to be outside for mud day. I’m glad I saw this before I clean the coffee pot. I usually dump them in the garden. My son will defininitely enjoy some of this. This is really cool! My son is looking at this with me and he wants to make it! I just happen to have all of those ingredients, so we’re looking forward to doing this soon! I hear ya! We live in Houston, and the only time we play outside is late in the evening with tons of bug spray. Occasionally Nick convinces me to go sweat to the oldies while he plays outside during the dreadful heat. The only outdoor activity that I’m down with during the summer days, is swimming! I love coffee, if you couldn’t tell by my blog name, and this is awesome! I think I’ll save my coffee grinds from yesterday and tomorrow to make this. Nick loves play doh, and so do I.. so how much fun. Plus, it’ll be like a little pick me up if I need it. 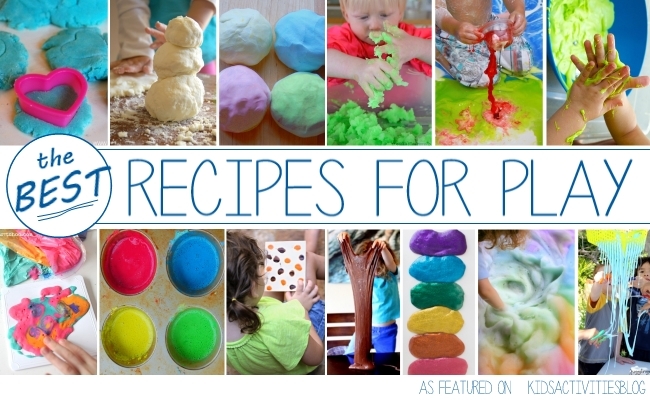 Do you have anymore awesome play doh recipes? Could you pretty much add anything in place of the coffee? [Well, with similar properties I guess]. Okay I babbled waaay too long! I get a little excited to see other Texans in blog land. Have a great morning! can i subscribe to email update posts? luv your site, great ideas to entertain my 2 yr old granddaughter. 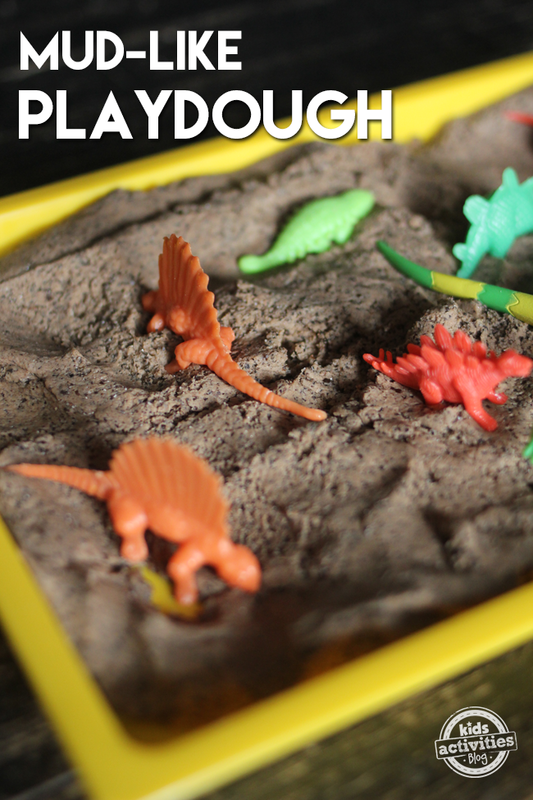 Oh my, what fab playdough! it looks fab and is perfect for mud sculptures. Love it! Bet it smells nice too! Brilliant! What a fab idea! Isn’t this amazing. As a preschool teacher I make this with the kids on the Monday that starts sensory week.. What better way to kick of a Monday morning!!! 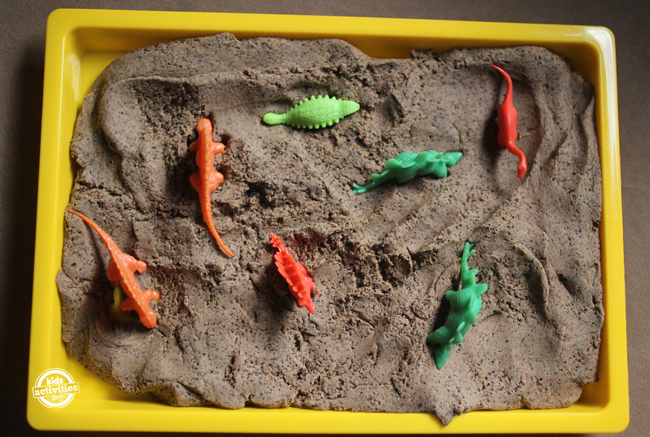 The next week of our curriculum is all @ dinosaurs–We play with the dinosaurs with this and then make fossils–use mini dinosaurs and press them sideways–let them dry for a few days and you will see the imprint! This is super! Can’t wait to try it out with my little ones. Thanks so much for sharing on Craft Schooling Sunday! What a fun idea! I am definitely going to save this recipe and make it for my son. I would love it if you would stop by the crafty link party I just started at http://linesacrossmyface.blogspot.com and link up this post. The kids will love this! Thanks for sharing! Great idea! We did this-this morning and the kids have been creating habitats all morning. Smells nice too:) I used it to let her create “diversity” project for science as well. Going to grow some mosses here soon … Should prove fun to combine. So if the children happen to eat it, they will get their daily caffeine buzz right? Any other ideas fir colouring?